ACLreconstruction is a common knee surgery among athletes and active people. It is estimated that several hundred thousand are performed each year in the United States. With increased sports participation, especially at the high school and collegiate levels, ACL knee injury has become commonplace among athletes. While many knee injuries can be treated conservatively, ACL tears often must be treated surgically. The ACL is a complicated and extremely important structure in the knee. Its absence causes great loss of function. It is widely accepted that it is necessary to reconstruct the ACL in younger, atcive people, to help preserve the long term health of the knee. 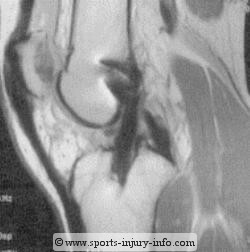 Lets look closer at this knee surgery, the ACL reconstruction. Simply put, an ACL reconstruction seeks to replace your damaged ACL with another similiar type of tissue. Reconstructing it means that it must be placed in the same position as your original ACL, and that the tissue used must have similiar properties to the ligament that was torn. It is important to realize that a reconstruction, when talking in surgical terms, is different from a repair. A repair means that the original tissue is somewhat still intact, and that it is mended in some way to return it to a working order. While many ligaments in the body can be repaired (such as in the shoulder), the ACL cannot. Primary repair of the ACL has long been abandoned as a failing procedure. The construction of the new ACL must be as close to the original as possible. There are many different types of tissues in the body that can be used for an ACL graft. 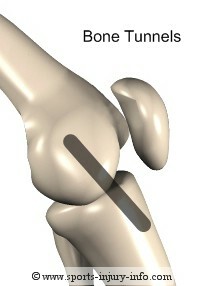 The two most common are the patellar tendon and the hamstring tendon. ACL surgery has been performed with other grafts as well, but by far, the majority of surgeries performed use one of these two tendons. The graft tissue can come from your own body, or may come from a cadaver. Cadaver grafts are called allografts, while your own tissue is called an autograft. Each has its own unique strengths and weaknesses. Most physicians will specialize in one type of graft use or the other. It comes down to their own philosophies, success, and training on which graft choice they prefer. I would encourage you to discuss with your physician the graft that will be used for your ACL reconstruction, and make sure that you are aware of the strengths and weaknesses of each tissue type. ACL reconstruction usually begins with a knee arthroscopy. You are placed under general anesthesia, and the physician places the arthroscope into your knee. They will use two portals, one on each side of the knee. One portal contains a camera, the other the tools to work with. Once the knee is explored and the pathology found, they will repair or "clean up" anything that is damaged. This is when they would perform a meniscectomy, to remove any torn meniscus , smooth out any rough areas of articular cartilage, and remove the torn portions of the ACL. 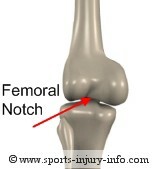 Once the "clean up" is finished, they will create a notchplasty in the femur to increase the size of your femoral notch. This is necessary to provide space for the new ACL graft. Depending on the graft type to be used, your physician will then harvest the graft from either the patellar tendon, or the hamstrings. This involves making an incision in the skin directly over either the patellar tendon or the hamstring tendon insertion. The graft is harvested, and then tunnels are drilled in both the tibia and the femur, over the "footprint" of your old ACL. After the tunnels are drilled, the new ACL graft is placed in the tunnels, tightened, and then secured using small screws. The incisions are closed, dressings applied, and you are sent to recovery. Please remember that this is just a general overview of the procedure. Each surgeon will perform the procedure according to their training and preferences. I treat ACL surgery patients daily. They all have lots of questions. I have provided information based on all of their different questions below. Learn about the benefits and drawbacks of this graft type, and how it plays into the reconstruction and rehab. Is the hamstring tendon graft a good choice for you? Read more about this tissue type, why it is used, and how it affects your rehab. A good start to pre-surgical ACL exercises to help you prepare for surgery. How much does it hurt? What will my knee feel like? What on earth is all of this yellow stuff? These questions and more are answered here. The first week after surgery is important to get yourself started out on the right foot. Learn about what you can do to maximize your recovery. Regaining motion after surgery is very important. Here are a few ways you can work to improve your motion. How long will you be on crutches? How long do you have to wear a brace? When can you run again? Read through my ACL timeline and learn more about what lies ahead.